Claude Debussy's La cathédrale engloutie (The submerged cathedral) in his Préludes Book 1 was inspired by the legend of the sunken city of Ys off the Brittany coast. My photograph above was taken in France, but not in Brittany. 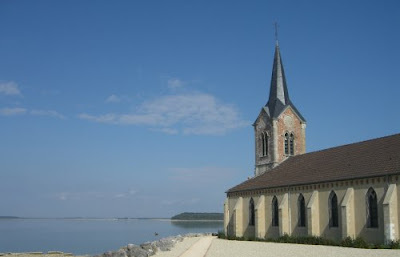 It shows the Church of Champaubert which is almost submerged by the waters of the Lac du Der Chantecoq in the Champagne region. The lake was created in 1974 as part of a massive flood prevention scheme for the tributaries of the River Seine. It covers 4800 hectacres, and its creation submerged three villages whose 345 residents had to be relocated. Champaubert was one of the villages flooded, but the church remains in eerie isolation by the lakeside. The huge man-made resovoir has been put to good use. A cycle path runs round the lake, and the area is now a major centre for watersports and cycling. The photo below shows me on the lakeside path. For cycling readers, I am riding my Moulton APB, which is the bike I travel with when serious off-roading is not on the agenda. 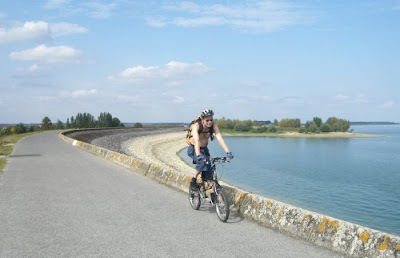 My ride round the lake was a lot more pleasant than that taken by Debussy's friend Ernest Chausson. In 1899 he lost control of his bicycle on a downhill slope, ran straight into the brick wall of his estate in Limary, Seine-et-Oise, and died instantly, aged 44. But no such mistakes by me on the big downhills. An interesting bit of music trivia. In 1930 Leopold Stokowski and the Philadelphia Orchestra performed an orchestral transcription of Debussy's La cathédrale engloutie with the bass line augmented by a theremin. But the low frequencies caused nausea in the back ranks of the srting section and the experiment was not repeated. Now playing - Debussy's La cathédrale engloutie, on a piano, what else? Gordon Fergus-Thompson is the pianist on the Brilliant Classics reissue of his ASV recordings of the complete piano music of Debussy and Ravel. Another brilliant bargain from the Dutch label. More on floods here and here.